When I think of hideout guns, North American Arms of Provo, Utah, is among the first makers that come to mind. There are a slew of companies that make small, concealable pistols, but very few specialize in making handguns for this particular role. NAA targets this niche specifically and only this niche. Often, when you dedicate yourself to such an exclusive mission, the result is that you become very good at what you do. The company was born with the Mini-Revolver. 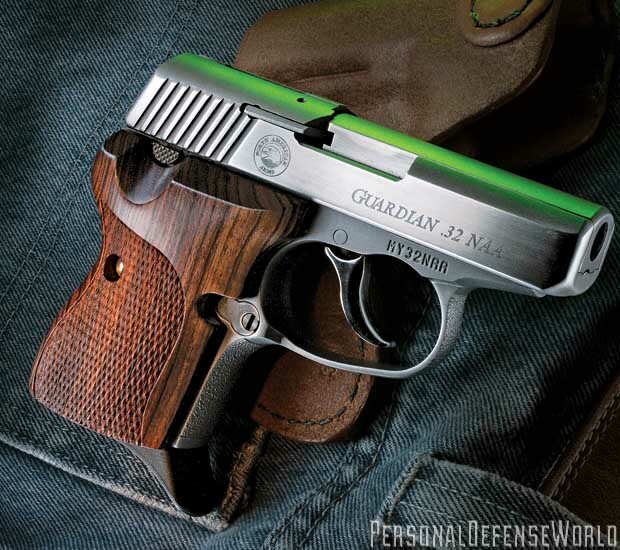 There is simply no more-compact defensive pistol available than the Mini. These mighty little guns pack a lot of punch for their size and weight. Frames, cylinders and barrels are CNC-machined from 17-4 PH stainless steel billet. 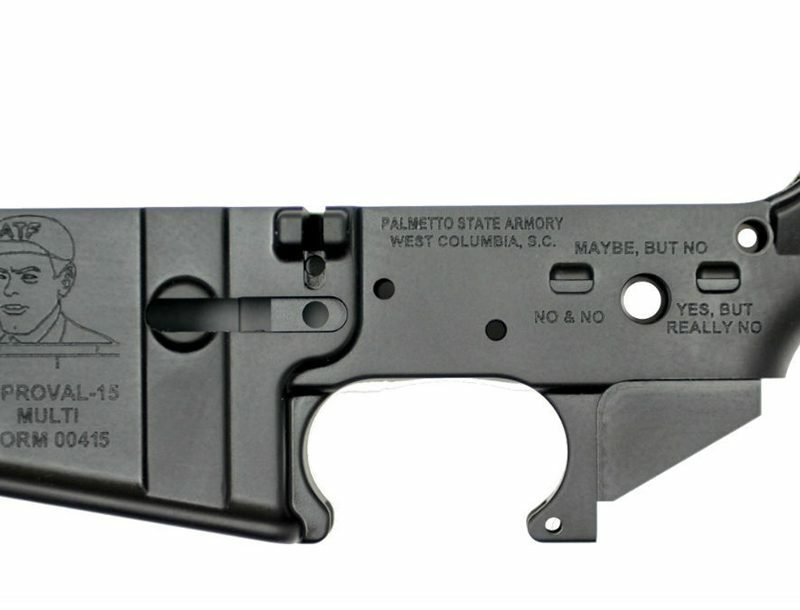 Most have a notch in the frame as a rear sight, and all have fixed front sight blades, some dovetailed, some with tritium. All of the Mini-Revolvers have five-shot cylinders, some smooth, others fluted, and all have safety notches for the hammer between chambers so that they may be safely carried with all chambers loaded. All are reloaded by removing a base pin, allowing the cylinder to be removed. All are chambered in .22, some in .22 Magnum and convertible to both calibers. 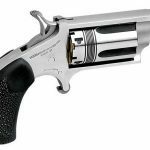 The Mini-Revolvers are all single-action (the hammer must be thumbed back for each shot) and this allows the design to be ultra-compact, as no triggerguard is needed. In addition to the numerous grip configurations and materials, NAA offers an endless array of modes to carry your Mini-Revolver, including belt slide, inside-the-waistband, shoulder (vertical and horizontal), pocket, flap, and thumb-break holsters in leather, either smooth or rough-side-out, or ankle holsters. They also offer belt buckles that secure the revolver in the face of the buckle. Though many of these items are made by other companies, NAA goes the extra mile to round up these excellent accessories and offer them all on their own site—truly one-stop shopping. 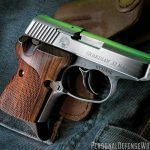 Not content to simply enjoy the success of the Mini-Revolvers, NAA developed a line of subcompact semi-auto hideout pistols as well, with the first pistols debuting in 1997. The Guardians are a simple design, and in this case, simple means they work. The frame and barrel are one piece, and the only large moving part is the slide. Savvy fans of pocket pistols will recognize that the Guardians were inspired by the coveted Seecamp auto. 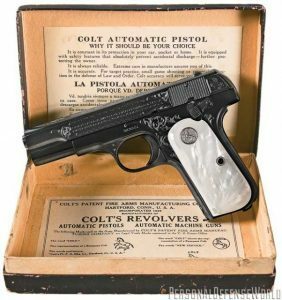 Certain improvements were made, such as a much more Americanized 1911-style button magazine release, a quick takedown button, integral sights, reliable feeding with all types of ammo, and eliminating the magazine disconnect. Best of all, the Guardians are readily available at a much more affordable price. There’s no waiting list. 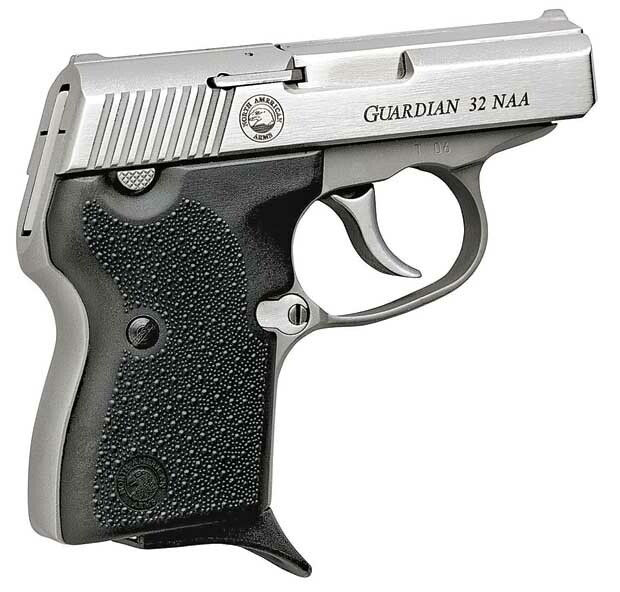 The first gun was the .32 ACP, the smallest of the Guardians. 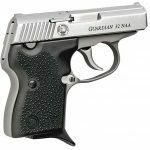 It was followed by the .380 model in 2001, which was slightly larger, but the overall length was only expanded to 4.75 inches, and weight to 18.72 ounces. In 2002, a joint venture with CorBon led to the development of the .32 NAA, a hotrod bottle-necked cartridge capable of 1,222 feet per second (fps) velocities. In 2004, the same collaboration released the .25 NAA, traveling 1,275 fps out of the 2.19-inch barrel. The Guardians share the quality fit and finish of the Mini-Revolvers. Their triggers are smooth double-action-only (DAO), making manual safeties unnecessary. 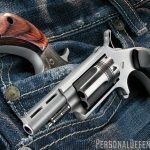 As one who has tested many of NAA’s guns, I can attest that they function reliably despite their diminutive size and weight. You’d be surprised at the accuracy the guns are capable of at close ranges, with a moderate amount of practice and concentration. 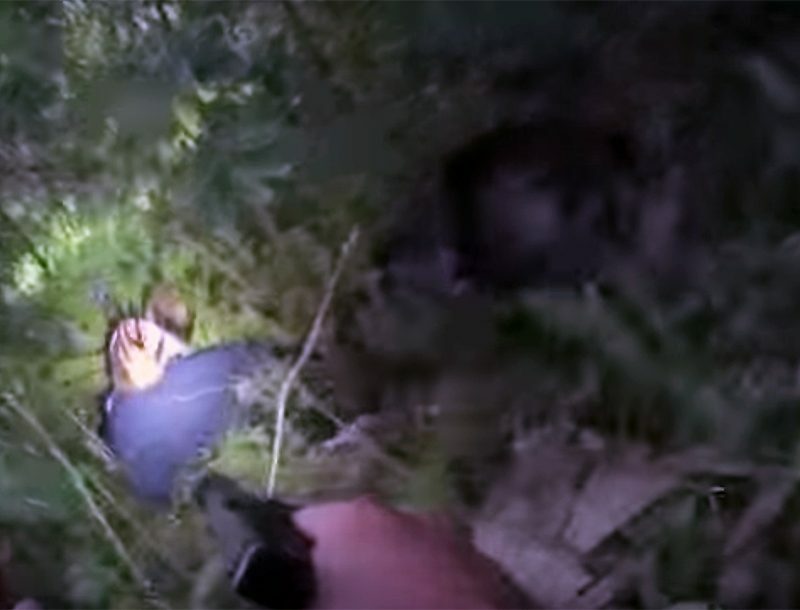 A very tight grip is the trick with the little revolvers. The NAAs are safe, too—I’ve never had a mishap handling any of them. By far, however, the ability to hide these guns and take them anywhere is their greatest strength—and I have carried them everywhere. 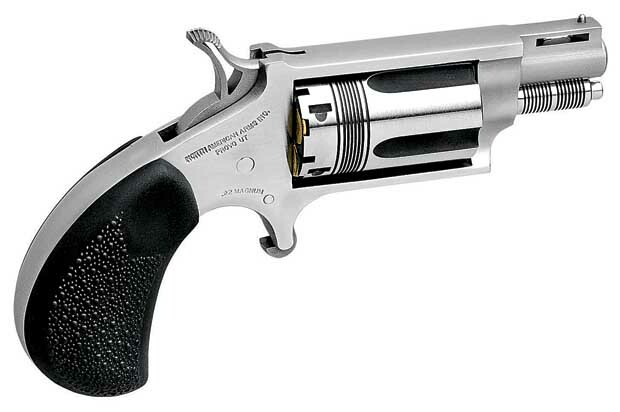 And stay tuned: North American Arms will soon be releasing a new model. 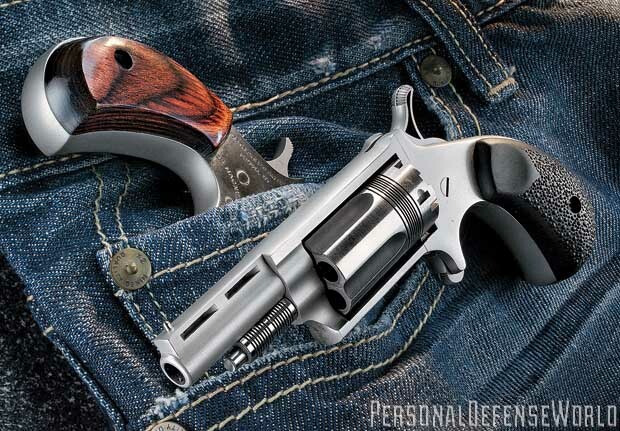 Think traditional revolver on a “mini” level! For more information, visit naaminis.com or call 800-821-5783.